OVER the last couple of weeks our littlest man has become a lot more active and is no longer content with sitting still. It’s as if he’s mastered sitting up on his own and is ready to move on to the next challenge. He’s pulling himself up onto anything and everything, and is having a good go at holding his weight on all fours – although he’s far more interested in standing. Strangely enough, this sudden burst of energy developed around the week I went back to work and Stew stayed at home … hmmm, funny that. Until now I’ve been happy to dress our bubba in babygros to try and hold onto the newborn stage (yes, I know we’re way past that at six months), but now that he’s nearly on the move it’s time to keep the all-in-ones for bedtime and put together actual outfits when we leave the house. I’m a big fan of babies wearing comfortable clothes that they can move around in, and I love boy leggings as they’re super cute. 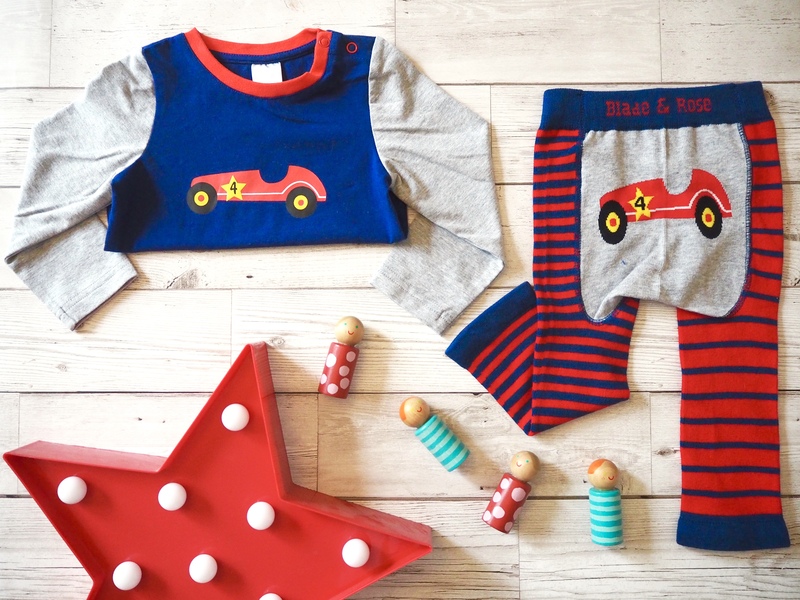 We were asked if we wanted to try out an outfit from Little Chickie, and I knew straight away that I would choose something from the Blade and Rose range. I was drawn first of all to a striped pair with a soldier on the back, but when I saw that the race car pair had a matching top my decision was made. The top (£12.95) is a lovely thickness and has a nice bright car on the front and Blade and Rose embroidered on the back. It also has poppers on the neck so it goes on nice and easily. For 9-12 months it does seem to be on the small size though – E is still in 6-9 in most clothes but there’s not much room for growth in this so I’d size up to be safe. So cute! The leggings are size 6-12 months and are a little big, but not huge so again I’d size up to get more wear out of them. Little Chickie has a really lovely range, and we’ll definitely be back for more baby leggings soon! Oh My Goodness, that outfit is so gorgeous!! !